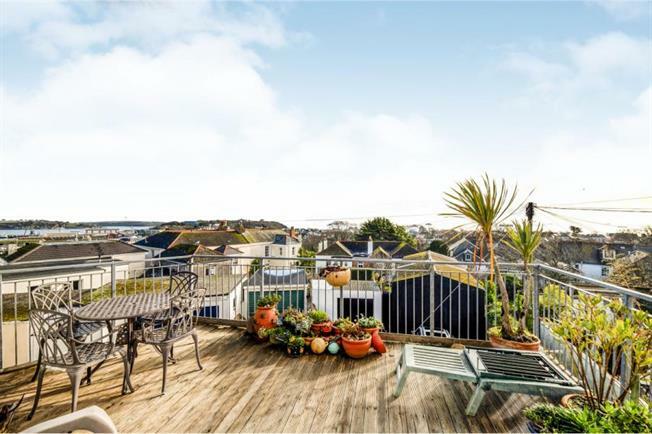 4 Bedroom Terraced House For Sale in Falmouth for Offers in excess of £350,000. A fine Grade II four storey listed town house located in this tucked away, quiet backwater, between the highly sought-after period houses on Wodehouse Terrace and Florence Place. This exceptional four bedroom family town house retains many period features which has been sympathetically restored with well proportioned and extremely versatile well planned and sociable reversed-level accommodation to capitalise upon the panoramic and extremely far-reaching views which extend over the harbour to Trefusis Point, across the Carrick Roads to St Just, St Mawes and the mouth of the Percuil River, and across the town to Pendennis Castle and out across Falmouth Bay. The lower ground floor will be of particular interest to those wishing to create an annex for either a dependant relative or a self contained flat subject to consents. Period staircase rising to first floor landing, doors to living room, bathroom and bedroom, further staircase descending to lower ground floor landing. Plus double glazed arched bay window to front aspect with deep window sill, open feature fire place with slate hearth, picture rail, radiator. Including airing cupboad, white bathroom sutie with corner shower bath and glass side screen, sink with built in vanity unit below, WC, ladder style heated towel rail, extractor fan. A generous irregular shaped room with a slight decrease in measurement, large recess to one side, sliding sash window to rear aspect, picture rail, laminate flooring and radiator. With potential to create a self contained flat subject to consents. Tiled flooring with doors off to bedroom, shower room and open doorway to workshop/utility room. Tiled flooring, window to front aspect glazed block tiles to part of one wall, radiator. Walk in shower cubicle with glass side screen, WC, wash hand basin, ladder style heated towel rail, feature glazed bricks to part of one wall allowing natural light to enter, recessed lighting, tiled flooring and extractor fan. Irregular shaped room with door and sliding sash window to rear aspect wall mounted gas combination boiler providing heating and hot water, plumbing for washing machine and dryer, tiled flooring. Attractive turning staircase with sliding sash window on the half landing taking in the stunning views, full height built in bookcase which again is a real feature, open doorway to dining area, door to study/bedroom, door to under stair cupboard, door to attic room. A range of quality fitted units comprising wall, base and drawer units with built in double oven and five ring gas hob with stainless steel extractor fan above. Stainless steel one and a half bowl sink with mixer tap, space for fridge freezer, sliding sash window to front aspect. Sliding sash window to front aspect, radiator. A great room with stunning views from the dormer window, exposed wooden flooring, radiator, exposed 'A' frame roof timbers with some restricted head height, generous eave storage area. With some of the most stunning views which extend over the harbour to Trefusis Point, across the Carrick Roads to St. Just, St Mawes and the mouth of the Percuil River, and across the town to Pendennis Castle and out across Falmouth Bay. A great place to sit out and entertain with a Southerly aspect and really has to be seen.